The church at Titchmarsh (Northamptonshire) contains two rare painted wooden mural monuments of the early eighteenth century, both painted by Mrs Elizabeth Creed (d. 1725), a talented amateur painter and writer of epitaphs. Born in 1642, she was the only daughter of Sir Gilbert Pickering by Elizabeth, the only daughter of Sir Sidney Montagu, and sister of Edward Montagu, first earl of Sandwich. On her father’s side she was the first cousin once removed of the poet John Dryden and on her mother’s side she was a second cousin of Samuel Pepys, in whose famous diary she is mentioned a good deal, although he disapproved of her marriage to John Creed of Oundle. John became deputy treasurer of the navy and subsequently Secretary for the Commissioners at Tangiers. The couple had eleven children, five of whom died in infancy and the eldest son, Major Richard Creed was killed at Blenheim; he has monuments in Westminster Abbey and at Titchmarsh, both with epitaphs written by his gifted mother. John Creed died in 1701 and during her widowhood, Mrs Creed resided many years in a mansion house at Barnwell, near Oundle, belonging to the Montagu family. Here she amused and employed herself in painting, instructed many young women in drawing, fine needle-work, and other elegant arts. Many of the churches in the neighbourhood of Oundle formerly boasted many good-quality monuments, altarpieces and other artefacts painted on wood and other media by her. Few now survive, but two wooden mural tablets can still be found at Titchmarsh. The bust on its pedestal sits under an arch adorned with delicate swags of foliage, which in turn is between two faux carved columns with urn-like pedestals and shields down the pillars. The painted panel is supported on a stone base with another inscription. The two stages of the pedestal, against which two cherubs rest, contain long inscriptions, the last of which reads ‘As the Last Testimony of the Esteem and Honour she had for Him, This was painted by his Afectionate and onely Sister to Preserve Ts [ie Theophilus’s] Dear Memory Amongst his Relations. E Creed: aged 68’. 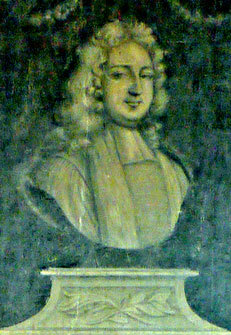 The first monument, in the north chancel aisle, painted in Mrs Creed’s sixty-eighth year, was in memory of her brother the Revd Theophilus Pickering, D.D., prebendary of Durham and successively rector of Gateshead and Sedgefield (d. 1710). This huge grisaille panel shows a well-executed bust of Pickering on a lofty inscribed pedestal, flanked by cherubs. 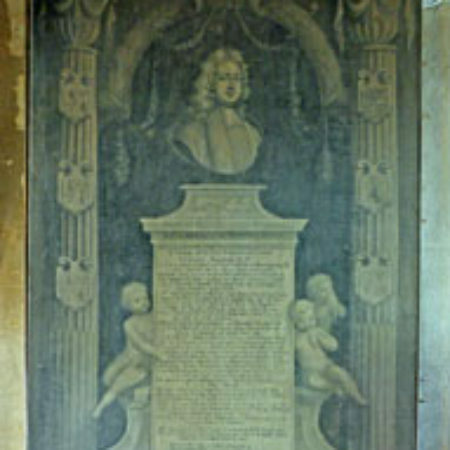 The second tablet, in the north nave chapel, was painted in 1722 in memory of her cousin John Dryden and his parents Erasmus Dryden and Mary Pickering. 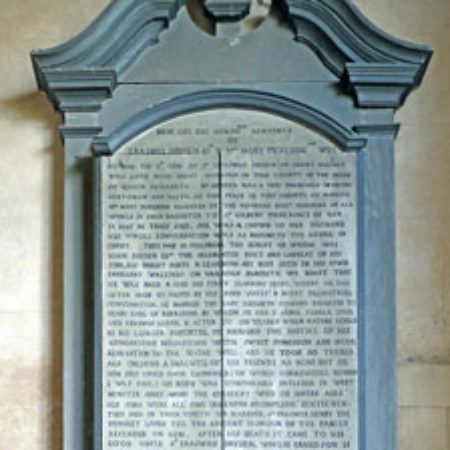 John Dryden died on May 12, 1700, and was initially buried in St Anne’s cemetery in Soho, before being exhumed and reburied in Westminster Abbey ten days later in Poet’s Corner. 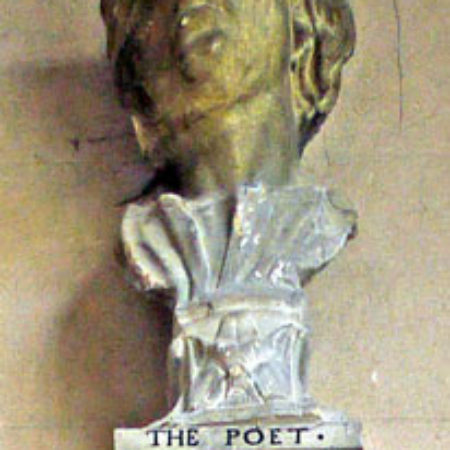 He is commemorated there by a pedestal monument with a bust atop, as befits the English poet, literary critic, translator, and playwright who was made Poet Laureate in 1668 and dominated the literary life of Restoration England to such a point that the period came to be known in literary circles as the Age of Dryden. 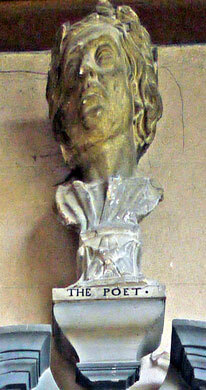 His memorial panel at Titchmarsh is a much simpler composition designed for contemplation by his family; it comprises a painted inscription in a carved wooden frame surmounted by a carved wooden bust of the poet, with the words ‘The Poet’ on its base. Extracts from the inscription read: ‘We boast that he was bred & had his first learning here [i.e. at the Pickering seat at Titchmarsh] where he often made us happie by his kind visits & most delightfull conversation … He recieued the notice of his approaching dissolution with sweet submission and entire resignation to the divine will. And he took so tender and obliging a farewell of his friends as none but he him self could have expressed (of which sorrowful number I was one) … The 80 year of my age. Eliza. Creed. 1722’. 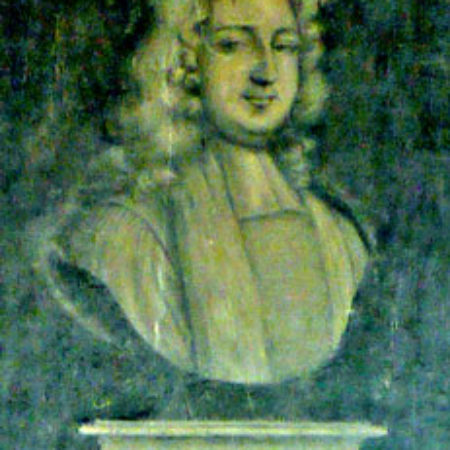 More of Mrs Creed’s monuments may be found in the church of All Saints Barnwell, including the painted decoration on the monument to her daughter Dorothy Creed (d.1714). It comprises a black arch-head tablet on west wall with ashlar surround, keyblock and moulded cornice surmounted by urn with torchere. Fig. 4 Close up of carved bust of John Dryden.